According to SUP ATX Paddleboard, their Maverick Sportsman isn’t just the most versatile board in their lineup, but also one of the best fishing paddle boards on the market. While the board falls somewhat short of such lofty claims, it is definitely a very good paddleboard and great for angling. The Maverick Sportsman has a length of 12'6” and it is 32 inches wide. The thickness of the board is seven inches and it weighs a total of 35 lbs, although it is able to handle up to 400 lbs. on deck. Molded EPS technology is used in the construction of the board and it features EVA memory foam to provide the deck with more traction. Thanks to its displacement hull, the Maverick Sportsman is able to provide superior glide, which makes for a much smoother ride. Although SUP ATX markets this board towards anglers, there isn’t a whole lot of angling specific features on it. The Maverick Sportsman comes with a single 10” removable fin as well as a leash loop. 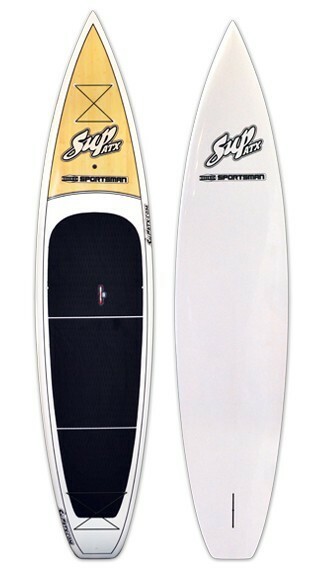 In addition, it has a LIFTSUP carry handle to make transporting the board a little easier. In terms of storage, the Maverick Sportsman can handle plenty of weight, but only has foredeck tie-downs to keep your gear secure. This means that you’ll have to come up with your own solutions for storing your catch and securing your rod while paddling. Overall, the SUP ATX Maverick Sportsman is a decent paddle board, but there are better angling specific options on the market if you want a board purely for fishing. On the other hand, if you want something that can be used for angling, but also racing or touring then the speed as well as the capacity of the Maverick Sportsman makes it a versatile choice.